Napkins. They can catch mustard falling off your hot dog in a single swipe and clean a child&apos;s ice cream-covered face in no time. But they can also be the backbone of modern boatbuilding design (damn the CAD drawings!). 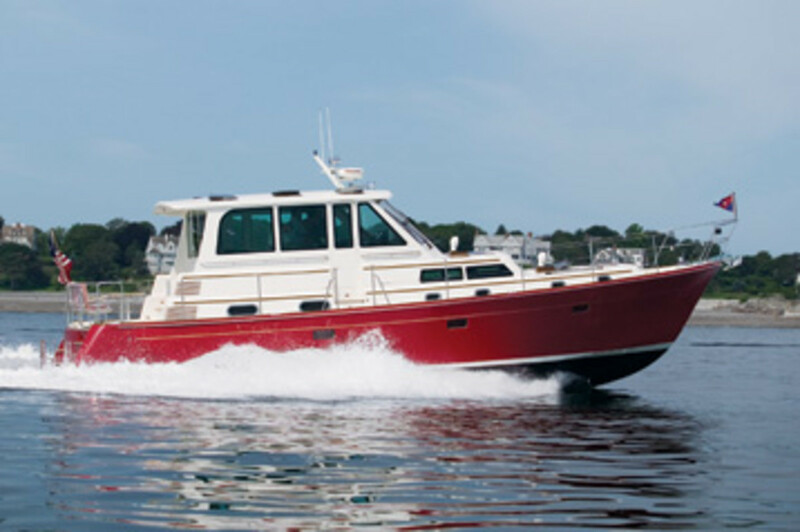 At least in one case: an innovative, Downeast-inspired, 50-footer called Sea Blitz I recently tested, whose life began as a napkin drawing (in a bar, of course). Designer Chris Hood of C.W. 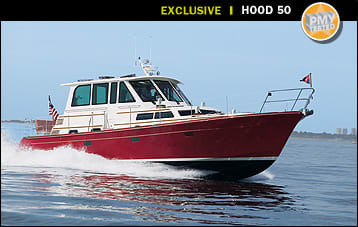 Hood Yachts and his friend and customer Geoffrey P. Noyes had talked about building Noyes his dreamboat for years. 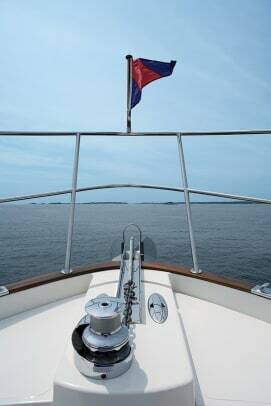 If the names Noyes and Hood sound familiar, it&apos;s probably because Noyes&apos; grandfather owned Ticonderoga, the famously fast 72-foot ketch designed by L. Francis Herreshoff, and Chris Hood, who has made a name for himself building sleek, high-end dayboats, is the nephew of famed yachtsman Ted Hood. Sea Blitz started life as a 38-footer, but as Noyes reviewed his requirements (consuming several more napkins), she grew to 40, then 45, and eventually 50 feet. Why 50? 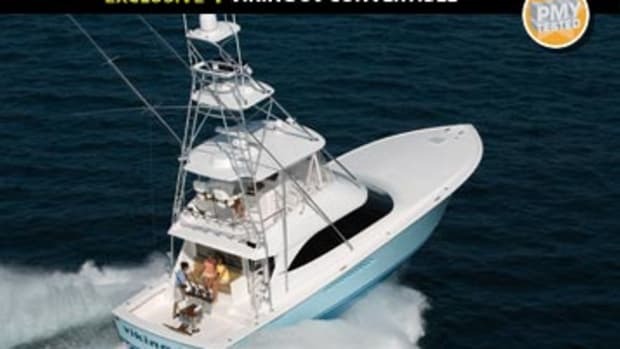 Noyes believes that it&apos;s a good size for an owner-operator, noting that if he&apos;d gone into the 60-foot-plus range, he might have needed a crew. And watching how Noyes piloted this red-hulled stunner through a tightly packed mooring field inside of Marblehead, Massachusetts&apos; Salem Sound (thank you, trolling valves), it was obvious she is indeed easily handled by one or two people, her nimbleness aided by 32x34, four-blade Teignbridge wheels that are spaced far apart. And during my wheel time, I was also able to effortlessly turn and spin her on her length. Her soft-touch maneuverability was equally pleasing at speed. 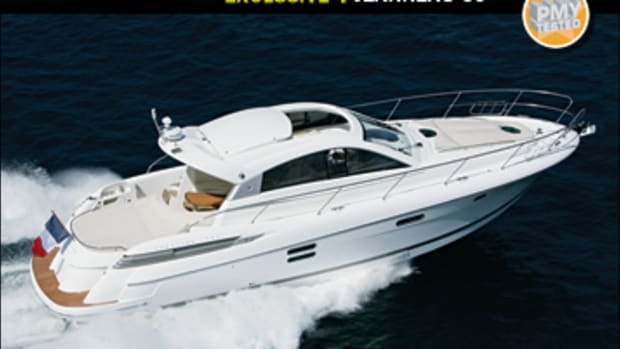 Standard power-assisted Hynautic hydraulic steering allowed me to ease the 50 into turns, and I always felt in control, whether her optional 730-hp MAN diesel V-drives were moving Sea Blitz along at a moderate 28-mph cruise or taking off at 34 mph (WOT). There&apos;s a comfortable feeling at the helm of this boat. Part of this I attribute to the fact that you can see in all directions, as windows encircle the bridge deck and provide a panoramic view. In addition, her Doug Zurn-designed planing hull displayed moderate bow rise; trim angle never exceeded 4.5 degrees, so I was able to see every lobster pot (and there were lots of &apos;em). Adding to the attractiveness of this cruiser&apos;s bridge-deck/saloon area is an abundance of wood. Satin-finished cherrywood bulkheads, a teak sole, and inlaid stained mahogany trim are employed liberally, and the joinerwork is pretty well executed. I did, however, note a few rough spots behind some of the 103 cabinet doors. Talk about stowage space. 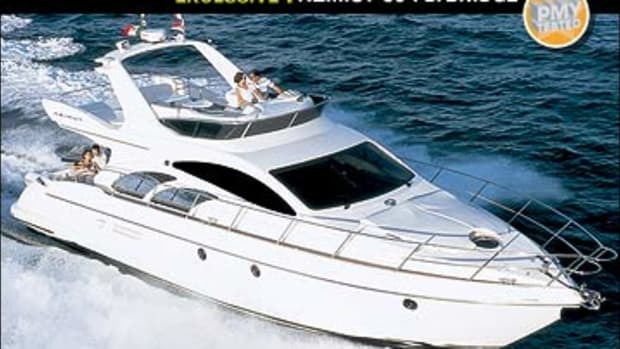 Noyes is going to need that space when you consider how much he likes to cruise. As a matter of fact, when construction on Sea Blitz was completed at the yard in Gdansk, Poland, he embarked on a 300-mile shakedown cruise to Germany. He then put the boat on a transport ship to the United States, where he was reunited with her in Baltimore, and ran her up to her home in Marblehead. Don&apos;t expect too much growth on this boat&apos;s bottom. 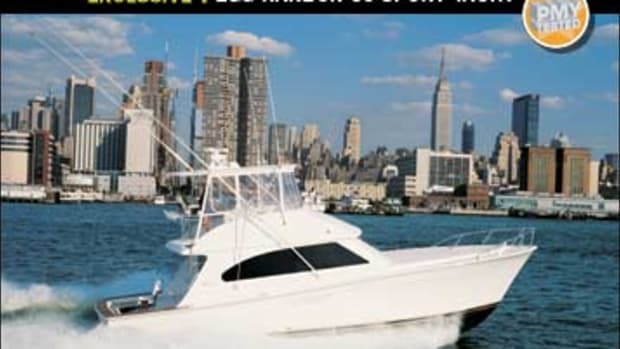 The plan is to cruise her to Florida by the time you read this and then do Christmas in the Bahamas. Considering this level of commitment to cruising, you can see why living space is so important. 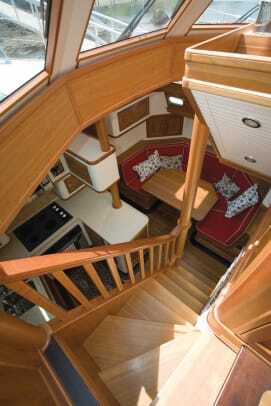 Thanks to V-drives and the fact that all tankage is low in the boat (the tanks are integral with the gelcoated grid system that reinforces the hull), Hood was able to create one-level living in a galley-down arrangement with enough space to accommodate GE household appliances and a U-shape dinette. Noyes also chose GE for the near-industrial-strength washer and dryer, which are tucked behind a door in the master stateroom. By the way, maximum headroom here is more than nine feet. I haven&apos;t seen a 50-footer with that kind of space. The bridge deck&apos;s windows, 11 hatches, and numerous portholes provide an immense amount of natural light, too, which combine with the headroom to create an open, expansive feel. 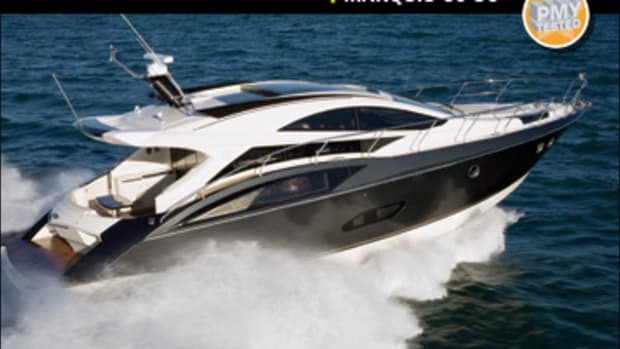 The amidships master spans the boat&apos;s roomy 17&apos;1" beam and sports an en suite head and walk-in closet. 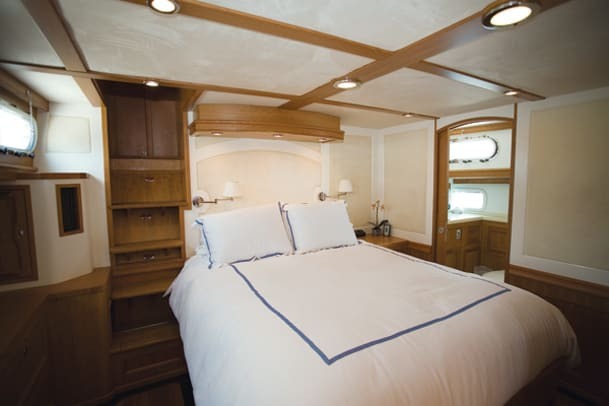 One of the coolest advantages gained from this one-level design is the use of sliding pocket doors that run on centerline between two sets of bunks to port and starboard, just forward of the galley/ dinette. Simply slide the door open on the port-side stateroom (the starboard bunks are open to the companionway), and the four bunks become one large playroom for the kids. A second head is located fully forward. 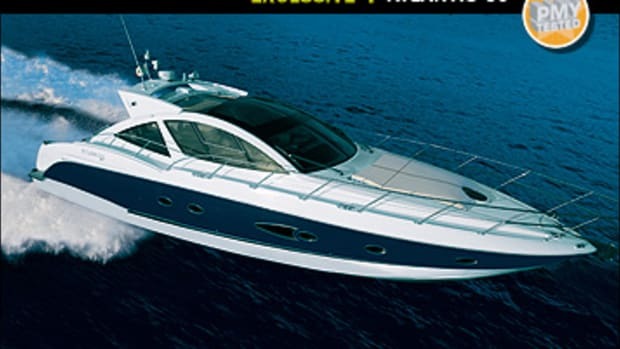 An optional arrangement allows for a forepeak VIP stateroom. But while I applaud Hood and his team for such innovative space planning and interior styling, sometimes being innovative also involves growing pains. One thing we discovered during our test was that a new electric fuel-switch system that is supposed to let the helmsman swap tanks on the fly had been wired improperly, resulting in a few stalls while attempting to change from the wing fuel tanks to the main. The problem was found and rectified, and we were back underway quickly. 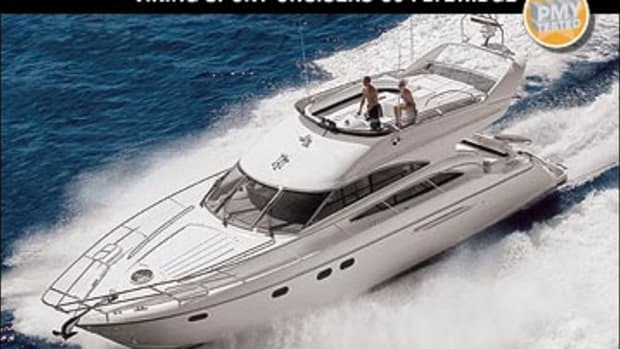 Another issue was the fact the test boat&apos;s MANs turned 93 rpm more than their rated speed, indicating the need for a bit more pitch. 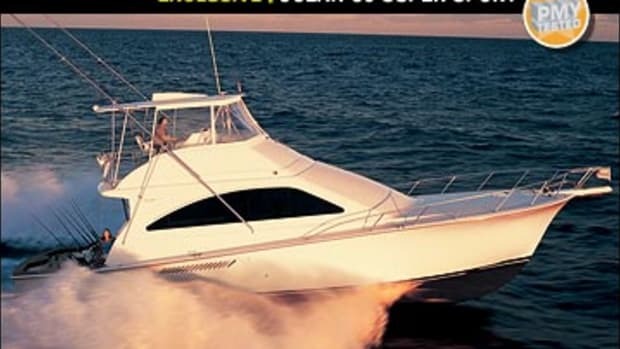 Still, to Hood&apos;s and Zurn&apos;s credit, their collaboration produced a boat that burns only about 52 gph at a 2000-rpm and 30-mph cruise, yielding 363 miles of nonstop motoring. At WOT and 2293 rpm, the 50 burned 70 gph and made 34 mph, offering a 306-mile range. I&apos;d expect even better numbers once the props are adjusted. 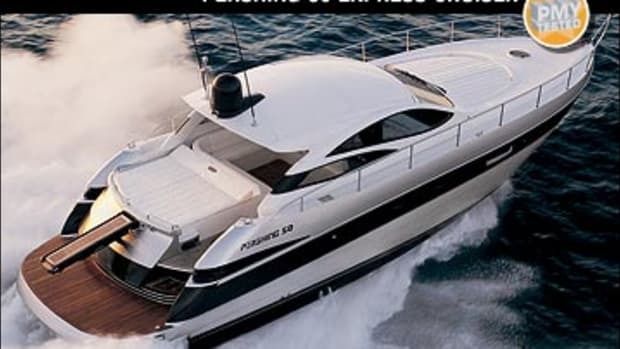 If this vessel sounds like she might fill the bill for you, you should also know that she can be customized to suit your needs. All you have to do is send Chris Hood your napkins. He&apos;ll know what to do with them.